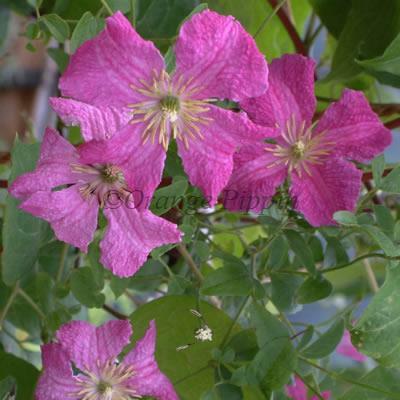 Clematis viticella 'Abundance' is one of the most popular of the vigorous climbing clematis varieties, and a well-established garden favourite. 'Abundance' freely produces beautiful reddish-pink, semi nodding flowers with deeply veined petals giving a textured appearance with a deep purple-red stripe/bar and green-yellow centres from July to September. Clematis viticella 'Abundance' was believed to have been originally hybridized by Francisque Morel of Lyon, France, before the First World War, and was subsequently given to William Robinson at Gravetye Manor. It was eventually passed on to George Jackman and Son and they named and introduced it. It was originally known as 'Purple Abundance', but this became simplified to 'Abundance'. Also raised by Francisque Morel of Lyon. This stunning, non-evergreen climber can be grown against a trellis, garden fence, wall, arches, pillars, pergolas, clambering over tree stumps or through large shrubs in the flower border. It should be hard-pruned after initial flowering, and you may then be rewarded with a further burst of flowers. 'Abundance' has a good climate range, tolerating both very cold winters and warm humid summer weather.